Nomenclature: Help Name My Characters! November 1, the start of NaNoWriMo, arrives in 11 days. 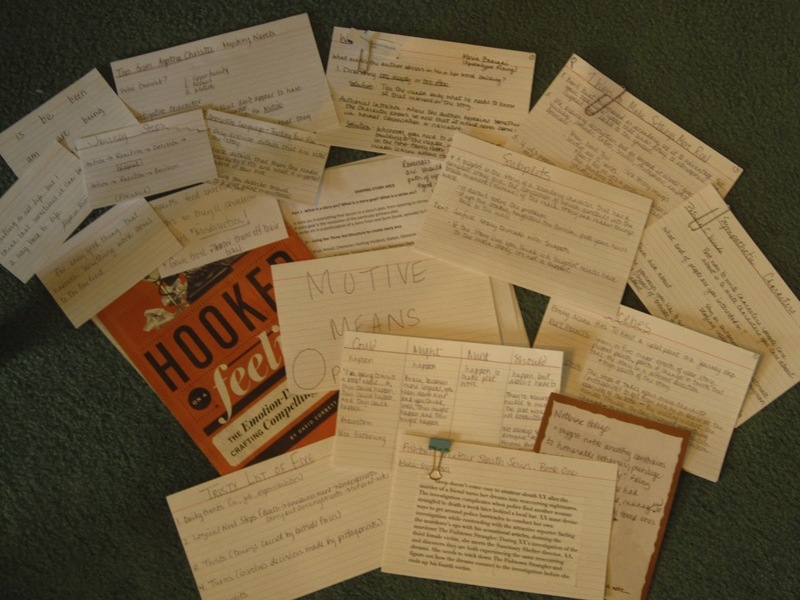 The planning of my amateur sleuth mystery novel gains clarity and complexity with each new technique and strategy Susan Meier presents in her class. A photograph of the hardcopy of my ideas, notes and inspirational quotes are above. The rest of my scaffolding is sitting on my computer. There's just one problem...my characters are nameless. I need help to decide on the best moniker for them. So, I hand over to you, my readers, the privilege of naming my characters. Of course, I plan to fill my novel with many more characters. These three are the only ones developed enough at this point. Some quick background: I drew inspiration from two famous literary characters and a notorious historical figure. I've included important character traits as well as the meaning of each name to help in the process. Just write your choices for the three characters in the comments below. Thanks for you help! For sancho panza, I like penelope (Ulysses wife, clever etc. and I like the sound of Dana and Pen together. I don't actually like pedro or placido for the pancho villa character. since he's going to be (in spirit anyway) a rebellious figure, I think he should be called something deceptively boring, like 'tim' or 'tony' then he can have the opportunity to 'rename' himself. just my 2 cents! I tend to agree with magpiewrites. I don't really like either Placido or Pedro. Placido - to me - is too closely tied to the great tenor. I would be seeing his face instead of your hero's. IF you use Pedro, I would go with that as his formal name and call him Pete [since Pedro is Spanish for Peter] which would both make him "deceptively boring" as magpie suggests, and lend a a little air of mystery [he would have two seemingly dissimilar names - and - posssibly - two personas, as well. For your main female character, I like Dakota - although it may be a trifle overused and trite. And for the sidekick I like Schuyler [ or did you spell it Skylar?]. I like Dakota and Shelby. As for the guy..I have no thoughts, which is odd since I always have thoughts. But Dakota is a strong female name. Shelby is more compassionate still a strong sidekick name, but more compassionate. Definitely Dakota and Skylar. How about a variation of "Loki" for the pancho character? Will you plot my next story for me? I admire and covet your thoroughness! :) Happy NaNo-ing! Ok Daya is my first gut instinct reaction to the first character. I don't like either for the third. But if I have to choose it would be Placido. However, it sounds too much like Placebo and Pedro is far too common. Xavier (Ha ve air) would personally be better, even if the meaning of the name doesn't fit the character. I don't always go by meanings for names, but some to stay away from these days are Sorcha (being a bit over done. I have a Sorcha and discovered dozens of other writers do as well...) Sasha is too close to Sorcha (IMHO). I like Daya and Simone. Like others neither Pedro or Placido particularly strike me for the Pancho character. Hey, how about "Pancho" for him? Just a thought. Love the visual of "scaffolding" for all the pre-work on a story. I sometimes call mine "skeletons." How about Panchito? It translates to "little Pancho", and it would be deceptive. That is perfect for a mystery novel. Sofia and placido. I love to choose names for my characters that have meaning. I think I like Daya and Sofia! I'm going to go with Daya, Sofia and Pedro. Great idea! Naming characters can be so hard. Good luck!